Every bathroom has a wash basin. What might surprise you is the range of different washbasin designs available today. This wide selection of basins enables you to build a functional bathroom and add style and beauty to the end result. Whichever type of style basin you require for your bathroom renovation or design, we have a stylish and affordable basin to suit. All the bathroom basins we sell are covered by manufacturer's’ warranty. We sell the Fienza Hydro range of washplane vanity tops. These tops are made of artificial marble and have a smooth attractive finish easy to clean and maintain. These vanity tops create space and aesthetic beauty in any bathroom.They are attractive but not designed as a basin you fill with water. You might prefer to look at these vanity tops as a shallow splash area for washing your hands. Our Fienza basins have a depth of 80mm at the rear. Are they practical? Stop and think when you last filled your bathroom basin with water. Washing machines and kitchen sinks now serve this purpose. • 900mm width with a single tap and splash area. • 1,200mm with dual taps and splash areas. • 1,500mm with dual taps and splash areas. Combine these vanity tops with the matching Fienza Bathroom Cabinet. We supply Tech glass basins from the Australian manufacturer Ledin. 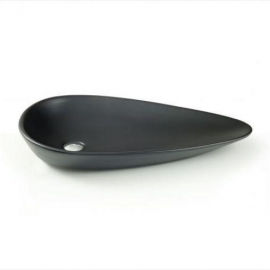 We carry a range of 8 different basins in different designs and sizes. These luxury basins add quality and style to your bathroom. You will find basins in glass, stone, and blaze finishes that add a sparkling brightness as feature pieces in your bathroom. • Onyx (black) shining stone finish in round and oval shapes. • Silver and black glass. • Blaze finish that adds sparkling brightness as feature pieces. • White and black tinted glass finish. We supply these basins in round or oval shape. We offer basin brand names like Fienza, Caroma, and Abey Gareth Ashton. These brand manufacturers make basins in stone white finish, sunstone, or a resin mix with clay mineral of sedimentary origin. These materials feature a velvety surface smooth and delicate to touch. • Cast stone finishes in matte white, black, or red colour. • White matte finish made from cast stone. • Black or red gloss finish made from cast stone. • Solid surface materials that produce fine and delicate lines. • Sunstone finish from Caroma with aesthetic quality and meticulous detail in matte finish. Some of these basins have an integrated solid surface pop up waste and towel rail with black or chrome finish. We offer 50+ products in our range of counter top basins. Brand names include Galleria. Fienza, Turner Hastings, Tempo, Caroma, ADP, JohnsonSuisse, Gareth Ashton, and Studio Bagno. Basin materials include ceramic and vitreous china. Basin shapes include round, oval, rectangular and basins with straight or bevelled sides, straight or curved corners, and curved vessel designs. Regardless of your preferences, you will find a counter top basin in our large collection that appeals to your taste for shape or colour. These counter top basins are very trendy today and will add a modern style to your bathroom decor. Pedestal basins mostly appear in public bathrooms like restaurants and entertainment venues. We offer two pedestal basins from R.A.K. Made in vitreous china, they feature a two-piece assembly. Visit our page Basins > Pedestal Basins to see photo illustrations of these basins. A vanity basin is a combination of a bathroom basin and the surrounding storage cabinetry. We supply the drop-in basin for a bathroom vanity arrangement. It is made of vitreous china and features standard overflow. We supply semi recessed basins from suppliers like Gallaria, Caroma, Gareth Ashton, and JohnsonSuisse. These basins are made from vitreous china and suitable for domestic or commercial use. They can be fitted to cabinetry with ease. Visit our page Basins > Semi Recessed Basin to see photo illustrations of our range of basins. You mount these basins below a surface countertop so that the basin “hangs” below the counter. They are suitable for solid countertops made of materials like granite, marble, or concrete. They are not suitable for tiled or laminate counters which have weak points. We supply undermount basins made by Caroma and JohnsonSuisse. The are made of vitreous china. In the Caroma range, you can select a design with geometric bowl with gently curved depth. We have a range of 20+ wall mounted basins and basin water mixers from brand names like Caroma, JohnsonSuisse, Fienza, Gareth Ashton, Brunetti, Lento, Studio Bagno, and Phoenix Toi. Some use wall mounted mixers, others have the taps fitted on the basin. These basins are made of durable vitreous china, or white washed double-glazed ceramic. The come in different sizes and shapes and are great space savers when mounted against a wall without surrounding cabinetry. The different design themes available offer alternatives for stylish and attractive bathroom decor for homeowners or commercial premises. These basins are the latest trend in modern bathroom decor. You mount them onto a vanity cabinet with half the basin underneath and half above the cabinet surface. This basin adds a modern and stylistic quality to your bathroom. To respond to this trend, we stock a range of 20+ inset basins in various shapes and design themes. You can choose round, square, rectangular, oval, semi-circular shapes and designs with square or rounded corners. It gives you a wide choice for adding a modern and stylistic quality to your bathroom. These basins come from the same brand names we stock for other types of basins. This is another innovate trend in design excellence and material innovation. The glass vanity tops have single or dual basins and you mount them on a bathroom cabinet. The Mambo brand offers two innovative material choices. • Some use 19mm thick tempered glass. • Their premium models using a manufacturing process kept as a trade secret. It uses glass and reconstituted stone blended together. Basins Please click on images to view our full range. Bathroom Tech has a large range of Solid Surface basins. Whichever type of style basin you require for your bathroom renovation or design, we are sure to have a stylish and affordable basin to suit. Bathroom Tech has a large range of pedestal basins. Whichever type of style basin you require for your bathroom renovation or design, we are sure to have a stylish and affordable basin to suit. Please browse through our online pedestal basins. Bathroom Tech has a large range of drop in basins. Whichever type of style basin you require for your bathroom renovation or design, we are sure to have a stylish and affordable basin to suit. Please browse through our online drop in basins. Bathroom Tech has a large range of semi recessed basins. Whichever type of style basin you require for your bathroom renovation or design, we are sure to have a stylish and affordable basin to suit. Please browse through our online recessed basins. Bathroom Tech has a large range of undercounter basins. Whichever type of style basin you require for your bathroom renovation or design, we are sure to have a stylish and affordable basin to suit. Please browse through our online under counter basins. Bathroom Tech has a large range of inset basins. Whichever type of style basin you require for your bathroom renovation or design, we are sure to have a stylish and affordable basin to suit. Please browse through our online inset basins. Mambo glass basin-tops are super smooth with an irresistible, softly curving basin. Available in 4 colour options, 5 widths, and single or double bowls. Mamo Living is all about design. Their designs are brought to life using the latest manufacturing techniques and materials. The result is an exceptional product with a pristine finish and long-term durability.